Alief was first settled around the time of the Civil War. A man with the redundant name of Reynolds Reynolds owned 1,250 acres of land here along the bayou. Reynolds sold out in 1888 and the buyer, Jacamiah Daugherty, granted a right-of-way to the approaching San Antonio and Aransas Pass Railroad the following year. Francis I. Meston purchased the land in 1893 and the following year Harris County surveyors listed the community as Diary, Texas. When the town received its first post office the name officially became Alief after Alief Ozella Magee, the first postmistress.--- The population was a mere 25 people in the mid 1890s. Alief suffered a flood in 1899 and the Galveston Storm hit the following year. Prone to frequent flooding, Alief’s prairies were perfect for rice farming and from 1900 through 1915 rice became the predominant crop. In 1901 Alief received an influx of German immigrants. A few years later many who had fled after the 1900 storm returned to bolster the community and the railroad invested in passenger and freight depots. An irrigation system reached Alief in the 1930s and reestablished rice farming. The Great Depression reduced Alief’s population from 112 to a mere 35.----But it rose to 200 by 1942 only to decline again after the war. The Alief ISD (established in 1911) is the most noticeable entity in town with several large schools and a 10 acre maintenance facility for the district’s school buses. 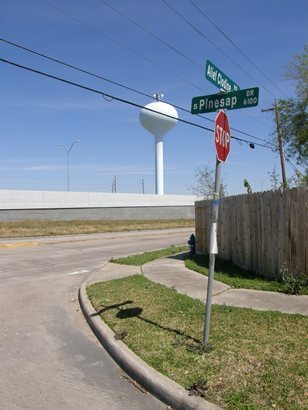 By the 1970s much of Alief had been annexed by Houston. The population has been given as 1,400 from the early 1960s through 2000. Alief-Clodine Road now parallels the Westpark Toll Road and it’s hard to tell where Houston leaves off and Alief begins due to Houston’s ever-expanding Chinatown.